This Snickers Hunger Maze contest ("Contest") is brought to you by Mars International India Pvt. Ltd. ("Brand") and made available by Amazon Seller Services Private Limited ("ASSPL"/ "Amazon") on the mobile application of www.amazon.in ("Amazon.in"). Please read these terms and conditions ("T&Cs") before participating in the Contest. This Contest will commence from 20th December, 2017 at 00:00:01 P.M. (IST) and end on 20th December, 2017 at 11:59:59 p.m. (IST) ("Contest Period"). In order to be eligible for the Contest, during the Contest Period you must solve the maze available at www.amazon.in/b?node=14396525031. Amongst all participants who solve a maze correctly, 40 participants will be selected by a random draw of lots to be eligible to receive Amazon Pay Balance worth INR 5000 ("Prize 1") from the Brand. Further, amongst all participants who solve a maze correctly AND purchase the ‘Snickers Chocolate Bar, 50g (Pack of 5) ' product ("Product") listed on Amazon.in by third party sellers, 10 participants will be selected by a random draw of lots to be eligible to receive a Fire TV stick from the Brand ("Prize 2") provided that the eligible participant's order for such Product should not have been cancelled or the Product should not be returned or refunded. 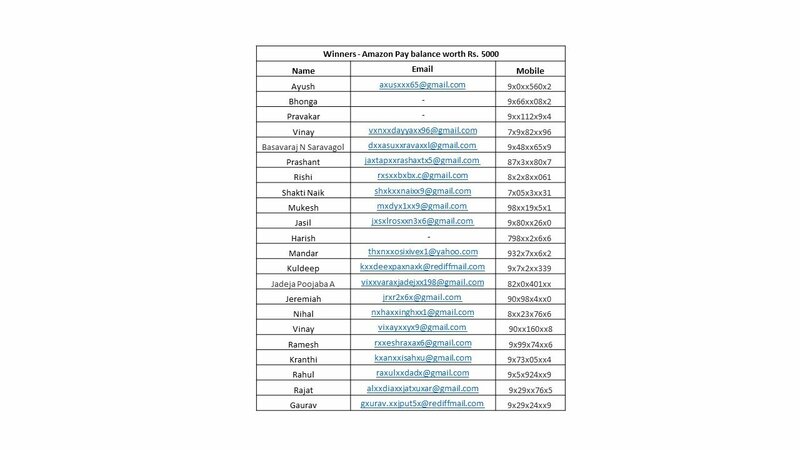 Prize 1 will be credited in the Amazon.in Amazon Pay Balance account of the winners on or before 31st January, 2018. For Prize 2, once the winners are selected, he/ she will be sent the contact details of the Brand that may be used to claim Prize 2 from the Brand. In the event the winner fails to claim Prize 2 within the stipulated time line, another winner may be chosen in accordance with the process set forth in these T&Cs. There is a total of 50 Prizes to be given to the 40 participants who are declared winners of Prize 1 and to the 10 participants declared winners of Prize 2 at the end of the Contest Period. 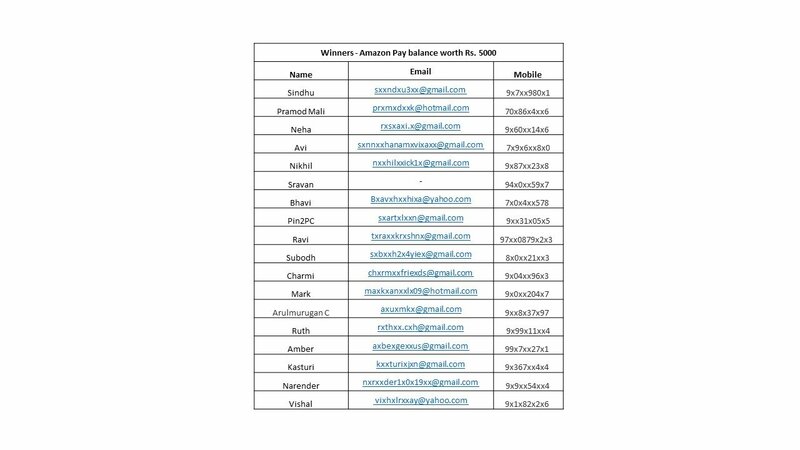 Amazon Pay Balance provided to eligible participants under this Contest will be issued in the form of Amazon Gift Cards issued by Qwikcilver Solutions Private Limited and can be redeemed on eligible products on Amazon.in subject to terms and conditions. The winners will be announced on or before 20th January, 2018. 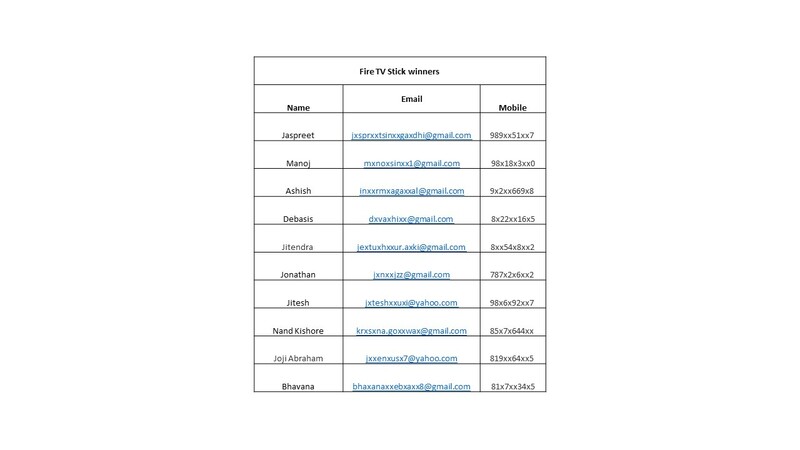 The winners will be contacted by email. The sponsor of this Contest is Mars International India Pvt. Ltd. having its registered office at Mars International India Pvt. Ltd, DLF City Phase 3, Gurgaon - 122010, India,. Please direct any questions, comments or complaints related to the Contest and/or the Prizes provided herein to Amazon India Customer Care.